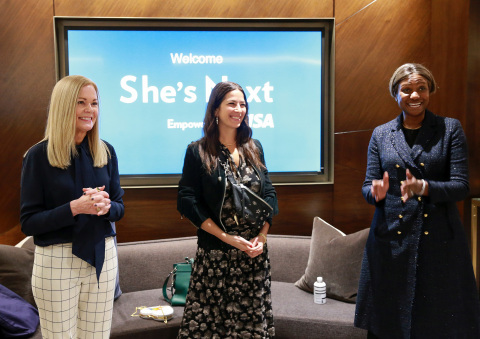 SAN FRANCISCO & NEW YORK--(BUSINESS WIRE)-- As part of its ongoing commitment to support female entrepreneurs, Visa (NYSE: V) is launching a global initiative – She’s Next, Empowered by Visa – to encourage women small business owners as they build, sustain and advance their businesses. The global rate of female entrepreneurship has been increasing more quickly than that of male entrepreneurs,1 with more than 163 million women around the world starting a business since 20142. She’s Next will champion this growing trend, with additional support from leading small business advocates, including Square and Yelp. She’s Next, will be supported by the Female Founder Collective (FFC) – a network of businesses led by women, supporting women – that launched in 2018 and quickly grew to over 3,000 members. From streamlining payment methods to linking women small business owners with like-minded peers and experts, Visa and FFC will together offer unmatched resources and opportunities for female entrepreneurs. Interactive Workshops: Beginning with an inaugural event in Atlanta on January 30, alongside Super Bowl LIII in Atlanta, Visa will host a series of interactive workshops to tackle business challenges specific to each community. Future events are planned for the FIFA Women’s World Cup France 2019™ and beyond. Access to Experts: Each workshop will include experts from Visa, local and national subject matter experts, and partners to maximize benefits to female business owners. Specifically at the inaugural workshop in Atlanta, leaders from Visa, Square and Yelp will bring their own expertise and innovation to the workshop. Key Motivators: The top three things women cite as motivators in starting their own businesses are: pursuing their passion (48%), having financial independence (43%) and having flexibility (41%). Money Matters: Nearly three quarters of women (73%) report that it was difficult to obtain the funding they needed to start their own business. In fact, six in ten (61%) self-funded their business. Digital First: When asked to identify top workshop topics they would like to learn more about, respondents said improved social media and digital marketing skills to promote and grow their businesses. Advertising Campaign: In 2019, Visa will launch phase two of its multi-million dollar Money is Changing marketing campaign in the United States, building on its millennial women focus and featuring real-life female business owners. Visa will feature a diverse spectrum of women in the campaign who will highlight the practical steps they have personally taken to change the game and challenge existing taboos when it comes to money. She’s Next builds off the success of Visa-supported programs focusing on small businesses, as well as female business owners. Recent examples include Visa’s sponsorship of the Great British High Street program in the United Kingdom and Visa’s Money is Changing marketing campaign in the United States. In addition to Visa’s efforts, the Visa Foundation made its first financial commitment of up to $20 million to Women’s World Banking. As a market leader in the small business segment in the United States, Visa provides a full suite of payment services designed for virtually every need, whether businesses are accepting payments from 3.3 billion Visa accountholders worldwide or making secure, seamless payments to their own providers using Visa Business credit, debit or prepaid cards. For more information on Visa’s small business solutions, please visit https://usa.visa.com/partner-with-us/info-for-partners/info-for-small-business.html. Visa Inc. (NYSE: V) is the world’s leader in digital payments. Our mission is to connect the world through the most innovative, reliable and secure payment network - enabling individuals, businesses and economies to thrive. Our advanced global processing network, VisaNet, provides secure and reliable payments around the world, and is capable of handling more than 65,000 transaction messages a second. The company’s relentless focus on innovation is a catalyst for the rapid growth of connected commerce on any device, and a driving force behind the dream of a cashless future for everyone, everywhere. As the world moves from analog to digital, Visa is applying our brand, products, people, network and scale to reshape the future of commerce. For more information, visit About Visa, https://usa.visa.com/visa-everywhere/blog.htmland @VisaNews.